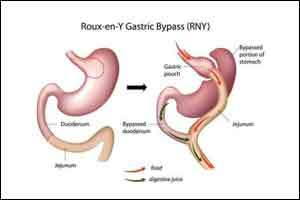 In a new population-based study, Dr Elaine Wei-Yin Yu at Massachusetts General Hospital, in Boston, Mass and colleagues have compared Roux-en-Y gastric bypass(RYGB) and adjustable gastric banding (AGB) with respect to efficacy and long-term side effects.The researchers have found that RYGB leads to greater improvements in metabolic health than AGB, but RYGB also causes accelerated bone loss and may increase fracture risk.It implies that patients undergoing Roux-en-Y gastric bypass (RYGB) surgery may be at greater risk for non-vertebral fracture than those having adjustable gastric banding (AGB), a new population-based study reports. The results have been presented at ENDO 2018, the 100th annual meeting of the Endocrine Society in Chicago, Ill.
“Bariatric surgery procedures, such as RYGB, are highly effective treatments that induce sustained weight loss,” said lead study author Elaine Wei-Yin Yu, M.D. “We found that Medicare patients who received RYGB had more fractures compared to those who received AGB. Importantly, we found that RYGB increased the risk for hip, wrist, and pelvis fractures. RYGB increased fracture risk across all age groups, in men and in women, although the effects were more pronounced among men,” said Yu, assistant professor of medicine at Harvard Medical School and director of the Bone Density Center at Massachusetts General Hospital, in Boston, Mass. Co-author Seoyoung C. Kim has financial relationships with Pfizer, Inc., Roche Pharmaceuticals, Bristol-Myers Squibb, and Merck.